"India says no to attack, but ready for retaliation with uncounted bullets"
New Delhi : Home Minister Rajnath Singh is getting tough day by day. After announcing ceiling of Indo-Pak border by the end of 2018, he has now warned that India does not believe in attacking anyone but if someone attacks us we will retaliate with uncounted bullets. 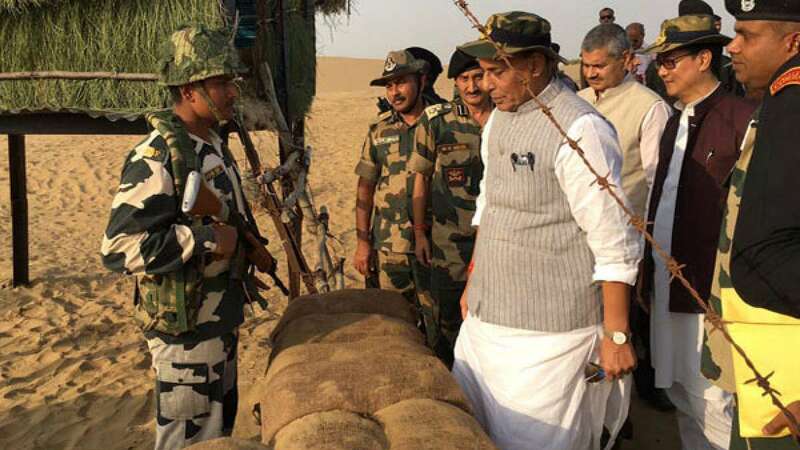 Rajnath Singh came up tough after reviewing security situation at BSF's Munabao Border Outpost. "Our heritage is 'Vasudev Kutumbakam' meaning the whole world is one family. We do not intend to occupy others' land. We never open fire first, but if attacked, in retaliation we never count the bullets after pulling the trigger," he said addressing the BSF personnel on the second day of his Rajasthan visit. Rajnath Singh also assured full support to soldiers from the government and lauded BSF personnel for effectively protecting our border under the extreme weather conditions. He paid a special attention towards the facilities of army men guarding borders, including repair work of damaged fencing, Floodlighting and a parallel road along the border fencing for patrolling. He assured that Home Ministry is also looking forward to solving the shortage of bullet proof jackets. The Minister had visited Murar and adjoining border outposts in Jaisalmer district and interacted with the BSF jawans on Thursday. # "Home Ministry is paying special attention to facilitating the border facilities for soldiers"
# He also said that damaged border fence will be urgently repaired and will be inspected periodically.